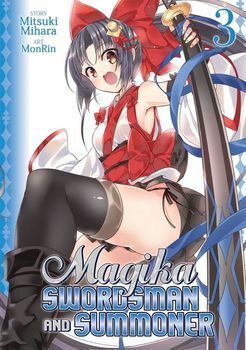 Magika Swordsman and Summoner is an ongoing series that contains coloured inserts in each volume. When humanity discovered an alternate dimension filled with magical and mythical beings, the world as we knew it would never be the same. Humanity soon learned to harness these extra-dimensional forces and summon mystical beings into their midst through the power of "summoners." Years later, fifteen-year-old Kazuki Hayashizaki is chosen to be the first male summoner. His attendance at an all-female summoner school is met with much opposition, especially from his sister, a magical swordsman whose task is to guard summoners. Now she finds herself in an inferior position to her brother Kazuki, and will stop at nothing to thwart him. As Kazuki struggles against his sister's machinations and the other female students in school who try to demean him at every turn, can he overcome adversity and learn to become a first rate summoner? For fans of Dragonar Academy comes an all-new fantasy adventure!